President George W. Bush returned to Washington DC briefly to commemorate the Bush Center and speak on the conflict in Syria. He was introduced by a famous Syrian dissident, who had to flee Syria in 2005, Ammar Abdulhamid. “America does not get to choose if a freedom revolution should begin or end in the Middle East or elsewhere. It only gets to choose what side it is on. The tactics of promoting freedom will vary, case by case. But America’s message should ring clear and strong: We stand for freedom and for the institutions and habits that make freedom work for everyone. President Bush singled out Syria, where the government of President Bashar al-Assad has killed thousands to squelch opposition. “All of us here today join you in hoping and praying for the end of violence and the advance of freedom in Syria,” Mr. Bush was speaking directly to Ammar Abdulhamid, a prominent Syrian opposition figure who introduced the president and spoke at the event. 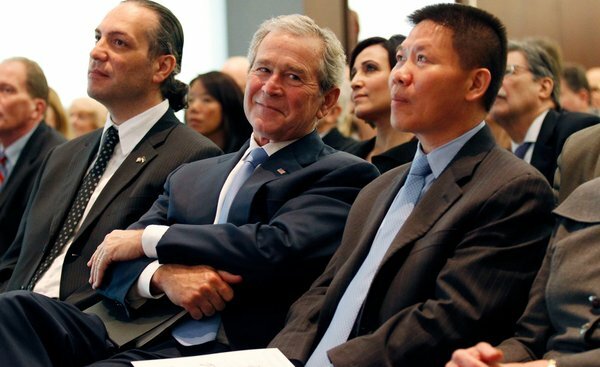 Above: President George W. Bush sitting beside Ammar Abdulhamid (left), a Syrian dissident living in Washington DC since 2005. Good morning. My name is Ammar Abdulhamid. I am a Syrian dissident. In September 2005, I was forced to leave my country for criticizing President Bashar Al-Assad. In exile I have lived in Washington with my loving family: my wife, Khawla, our daughter, Oula, and our son, Mouhanad. Together, with help from our friends here and in Syria, and with funding from the Middle East Partnership Initiative, a program established by President George W. Bush, we launched a foundation dedicated to supporting pro-democracy activists in Syria and across the Middle East. We worked hard at developing the leadership skills of young men and women who, from depths of despair and oppression, were trying to stitch together advocacy networks. These networks were dedicated to raising awareness about both democracy and the practice of civil disobedience. The aim was to hold government accountable to the will of the people. Hard work finally began to pay off when people all across Syria, inspired by Tunisia and Egypt, rose up against the corruption and oppression of the Assad regime. The movement was peaceful and inclusive. The cross and the crescent were held high. Arabs and Kurds, Muslims and Christians, Sunnis and Alawites, all demanded a transition to democratic governance. In response, Bashar Al-Assad showed he was just a common thug. To hold power and keep his fortune, he ordered troops, supported with tanks and heavy artillery, to attack peaceful demonstrators, and death squads to assassinate reformers. In little over a year, 15,000 people have been killed, 80,000 are languishing in jails, and more than 250,000 have become refugees. The international community has done little to help the Syrian people. But it is still our hope that world leaders will be compelled by their own conscience and by their national self-interest to act – to end this tragedy, and help bring Syria freedom. The stories of dissidents highlighted in the Freedom Collection can help motivate international policymakers to do the right thing. The Collection also helps oppressed people break the barrier of fear and the wall of silence that descends under autocratic rule. The Collection shows that freedom advocates are not alone. Others went before – and their stories teach where success lies. It is not easy. While the price of activism is sometimes the death of the human body, the price of silence is always the death of the human spirit, and that is a far greater price to pay. Protesters in Syria and around the world draw inspiration from President George W. Bush. During his administration, President Bush personally met with more than 180 pro-democracy and human rights activists, independent journalists, and their family members from 35 countries. He initiated programs that inspired, informed and trained thousands of young freedom advocates across the Middle East and North Africa, many of them now in leadership roles in their changing countries. And upon leaving office, he founded the George W. Bush Presidential Center, dedicated to improving the human condition throughout the world, with a strong emphasis on unleashing freedom in nations like Syria. Ladies and Gentlemen, please join me in welcoming the 43rd President of the United States, George W. Bush. President Bush stands in stark contrast to Obama when it comes to supporting freedom and democracy. Bush actually went after dictators and removed them from power, while Obama flails around aimlessly making empty threats. Visit President Bush’s Freedom Collection website and watch the interview with Ammar Abdulhamid and other freedom loving people throughout the world.